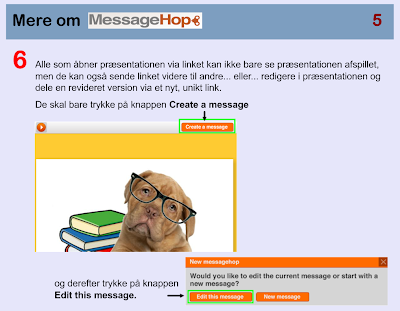 Med den gratis webtjeneste Message Hop kan ALLE lave en fin, animeret billedpræsentation, med eller uden tekst, som kan deles med andre via et link, via e-mail, Facebook eller Twitter. 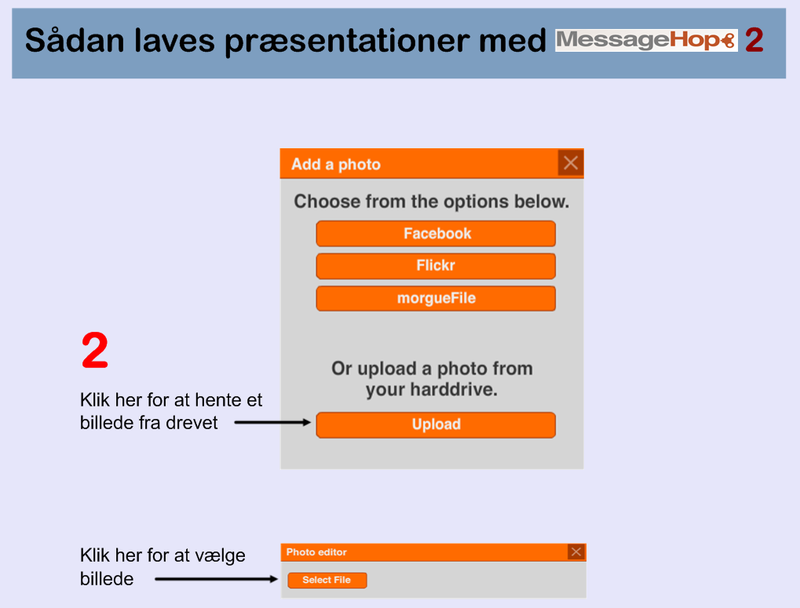 Et mere lettilgængeligt, digitalt præsentationsværktøj skal man lede længe efter… og her kan selv de yngste elever (med en smule hjælp) være med. Man skal nemlig hverken være tilmeldt, logget ind, angive kontaktoplysninger eller andet for at anvende tjenesten. I al sin enkelhed er der tre vigtige knapper at arbejde med i dette værktøj. Den ene hedder “Add Photo” og den anden hedder “Add Text”. Hent et billede fra drevet, tilføj noget tekst, hent et nyt billede, tilføj tekst. 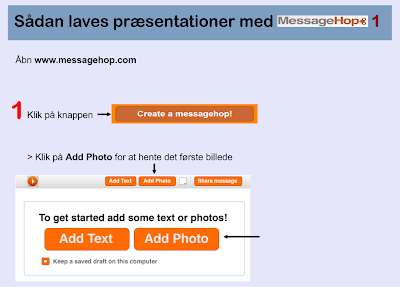 Når du er færdig med at indsætte billeder og tekst trykker du på “Share message”-knappen. 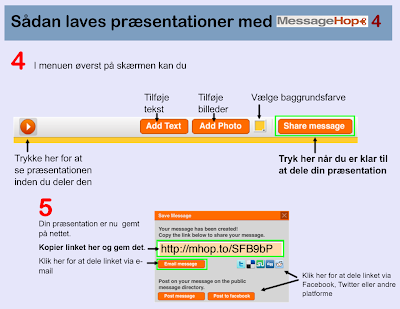 Så får din præsentation en url-adresse (et link), som kan gemmes og deles. 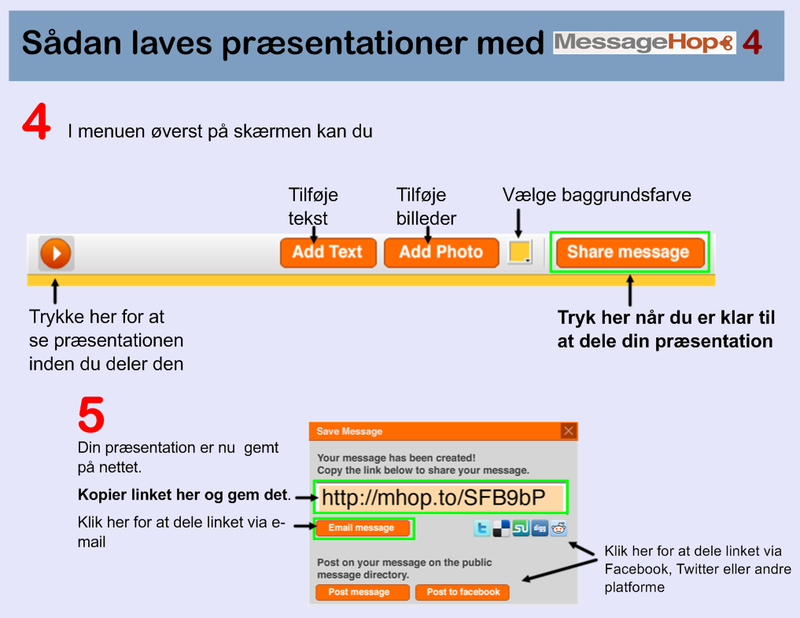 Præsentationen ligger herefter gemt på nettet og kan åbnes igen og igen via linket. Præsentationen gøres automatisk animeret, dvs. at den afspilles fra top til bund, når man trykker på linket – Se mit eksempel her, inden du læser videre. 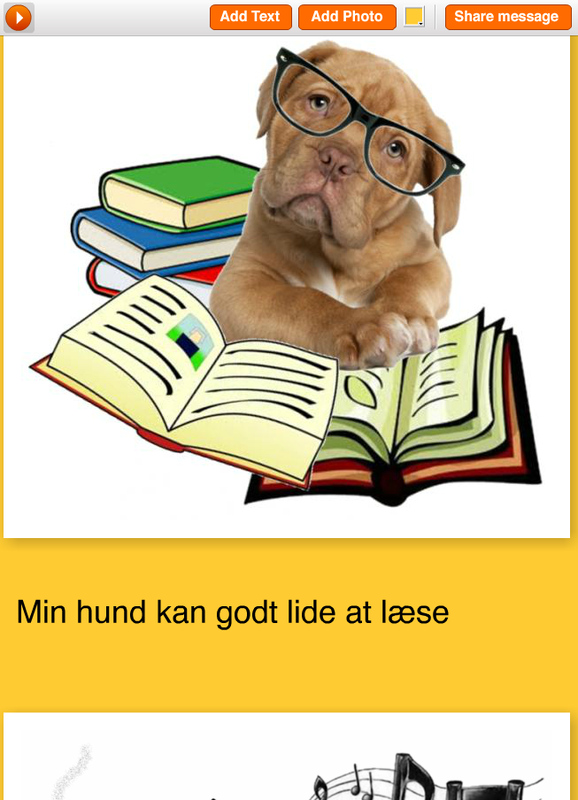 Man kan også scrolle op og ned i præsentationen, så der bliver mere tid til at læse teksten. Som eksemplet viser kan man desuden vælge smarte, animerede effekter til teksten, men det kan selvfølgelig undlades, hvis man finder dem forstyrrende for indholdet.I stedet for billeder eller udover billeder kan man også indsætte links. Og nu kommer vi så til det mest geniale:… Alle der åbner præsentationen kan redigere i den, hvis de vil. Dvs. at de f.eks. kan tilføje mere tekst eller indsætte nye billeder og dele arbejdet som en ny præsentation via et nyt, unikt link. 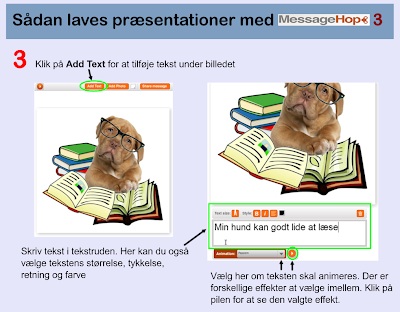 Som underviser kan du altså lave et oplæg ved at oprette en præsentation med et billede og lidt tekst eller måske et link til en webside. Herefter give præsentationens link til dine elever og lade dem arbejde videre med oplægget hver for sig. Eleverne kan herefter sende dig præsentationen med deres input via e-mail, og elever som ikke har egen e-mailadresse instrueres i hvordan et link kopieres gemmes og deles. I klasselokaler med elektroniske tavler kan alle præsentationerne efterfølgende vises og diskuteres i fællesskab. It is actually a great and useful piece of information. I?¦m happy that you simply shared this helpful information with us. Please stay us up to date like this. Thanks for sharing. Hey! I just want to give a huge thumbs up for the good information you have right here on this post. I shall be coming again to your blog for more soon. Very nice post. I just stumbled upon your weblog and wanted to say that I’ve truly loved browsing your blog posts. In any case I’ll be subscribing to your feed and I’m hoping you write again very soon! I got what you intend, regards for posting.Woh I am happy to find this website through google. “It is a very hard undertaking to seek to please everybody.” by Publilius Syrus. You have noted very interesting points! ps nice site. “Every man over forty is a scoundrel.” by George Bernard Shaw. This is really fascinating, You are an overly skilled blogger. I have joined your rss feed and look ahead to searching for extra of your magnificent post. Additionally, I’ve shared your website in my social networks! Appreciating the hard work you put into your site and in depth information you provide. It’s good to come across a blog every once in a while that isn’t the same out of date rehashed material. Wonderful read! I’ve saved your site and I’m including your RSS feeds to my Google account. F*ckin’ tremendous things here. I am very glad to see your article. Thanks so much and i am taking a look ahead to touch you. Will you please drop me a e-mail? Fantastic site. A lot of useful info here. I am sending it to several pals ans also sharing in delicious. And of course, thanks in your effort! Hi there, I discovered your site by means of Google whilst looking for a similar subject, your web site came up, it seems good. I’ve bookmarked it in my google bookmarks. You have noted very interesting details! ps nice web site. “Formal education will make you a living self-education will make you a fortune.” by Jim Rohn. I believe this site holds some very wonderful information for everyone :D. “Experience is not what happens to you it’s what you do with what happens to you.” by Aldous Huxley. Excellent site you have here but I was wondering if you knew of any community forums that cover the same topics talked about in this article? I’d really like to be a part of group where I can get suggestions from other experienced individuals that share the same interest. If you have any recommendations, please let me know. Thanks a lot! I really enjoy studying on this web site, it has wonderful content. I¦ve been exploring for a little bit for any high quality articles or blog posts on this sort of space . Exploring in Yahoo I eventually stumbled upon this web site. Reading this information So i¦m glad to show that I have an incredibly good uncanny feeling I found out exactly what I needed. I such a lot indubitably will make certain to don¦t forget this web site and provides it a look regularly. Perfectly written written content, thankyou for selective information. The core of your writing whilst sounding reasonable initially, did not really sit well with me after some time. Someplace throughout the paragraphs you were able to make me a believer unfortunately only for a very short while. I however have got a problem with your jumps in logic and one would do well to help fill in those breaks. In the event that you actually can accomplish that, I would certainly end up being amazed. You actually make it seem so easy with your presentation but I find this matter to be really one thing which I feel I’d by no means understand. It sort of feels too complicated and very wide for me. I am taking a look ahead in your next post, I’ll try to get the dangle of it! Some truly nice and useful info on this internet site, as well I conceive the pattern holds fantastic features. Hey there, You’ve done an excellent job. I’ll definitely digg it and individually recommend to my friends. I am confident they will be benefited from this web site. That is the suitable weblog for anybody who desires to seek out out about this topic. You understand a lot its virtually exhausting to argue with you (not that I truly would need…HaHa). You positively put a new spin on a subject thats been written about for years. Great stuff, simply great! Magnificent goods from you, man. I’ve understand your stuff previous to and you’re just too magnificent. I actually like what you have acquired here, certainly like what you are stating and the way in which you say it. You make it entertaining and you still care for to keep it wise. I can not wait to read far more from you. This is really a terrific site. Hiya, I am really glad I have found this information. Today bloggers publish only about gossips and web and this is really irritating. A good website with interesting content, this is what I need. Thanks for keeping this website, I’ll be visiting it. Do you do newsletters? Cant find it. Hi, i read your blog occasionally and i own a similar one and i was just curious if you get a lot of spam responses? If so how do you prevent it, any plugin or anything you can recommend? I get so much lately it’s driving me mad so any assistance is very much appreciated. Hmm it appears like your site ate my first comment (it was super long) so I guess I’ll just sum it up what I wrote and say, I’m thoroughly enjoying your blog. I as well am an aspiring blog writer but I’m still new to the whole thing. Do you have any helpful hints for beginner blog writers? I’d definitely appreciate it. Generally I do not learn post on blogs, however I wish to say that this write-up very pressured me to try and do it! Your writing style has been amazed me. Thanks, very nice article. Some truly good info , Glad I discovered this. “Prayer indeed is good, but while calling on the gods a man should himself lend a hand.” by Hippocrates. whoah this weblog is excellent i like studying your posts. Stay up the good work! You realize, many individuals are looking round for this information, you can aid them greatly. You have observed very interesting points! ps decent website . “In music the passions enjoy themselves.” by Friedrich Wilhelm Nietzsche. This website online is really a walk-by way of for all the information you wanted about this and didn’t know who to ask. Glimpse right here, and also you’ll positively uncover it. Thanks for this terrific post, I am glad I discovered this site on yahoo. Very interesting details you have observed, appreciate it for posting. “Jive Lady Just hang loose blood. She gonna handa your rebound on the med side.” by Airplane. What¦s Taking place i am new to this, I stumbled upon this I have found It absolutely useful and it has helped me out loads. I hope to give a contribution & aid other users like its aided me. Great job. It’s actually a great and helpful piece of information. I’m glad that you simply shared this helpful information with us. Please stay us up to date like this. Thank you for sharing. I was more than happy to seek out this web-site.I wanted to thanks in your time for this wonderful learn!! I undoubtedly having fun with every little little bit of it and I’ve you bookmarked to check out new stuff you blog post. I conceive this web site contains very superb pent content material articles. What i don’t realize is in reality how you’re not actually a lot more neatly-appreciated than you may be now. You are very intelligent. You recognize thus significantly in relation to this matter, produced me in my opinion imagine it from so many various angles. Its like women and men aren’t fascinated until it is one thing to accomplish with Woman gaga! Your own stuffs great. At all times handle it up! I?¦m now not positive where you’re getting your info, however great topic. I must spend some time learning much more or figuring out more. Thanks for great information I was looking for this info for my mission. When I initially commented I clicked the -Notify me when new feedback are added- checkbox and now every time a remark is added I get 4 emails with the same comment. Is there any method you can take away me from that service? Thanks! I do love the manner in which you have framed this specific difficulty plus it does indeed give me personally some fodder for thought. However, coming from just what I have personally seen, I basically wish when the comments pack on that individuals remain on point and in no way start upon a tirade regarding the news of the day. Still, thank you for this superb point and while I do not really concur with the idea in totality, I respect your perspective. Fantastic site. Lots of useful information here. I am sending it to several buddies ans also sharing in delicious. And naturally, thanks to your sweat! hello!,I really like your writing very a lot! percentage we be in contact more about your article on AOL? I need a specialist in this area to resolve my problem. Maybe that is you! Taking a look forward to peer you. I have been browsing online greater than three hours as of late, but I by no means found any fascinating article like yours. It¦s lovely worth enough for me. Personally, if all website owners and bloggers made just right content as you probably did, the net will probably be a lot more useful than ever before. Great website. Lots of useful info here. I am sending it to a few friends ans additionally sharing in delicious. And certainly, thanks for your sweat! F*ckin¦ remarkable issues here. I am very happy to peer your post. Thank you a lot and i’m looking forward to touch you. Will you kindly drop me a e-mail? I genuinely enjoy looking through on this internet site, it holds excellent blog posts. “A short saying oft contains much wisdom.” by Sophocles. The following time I learn a blog, I hope that it doesnt disappoint me as much as this one. I imply, I know it was my option to read, but I really thought youd have something attention-grabbing to say. All I hear is a bunch of whining about something that you could possibly repair for those who werent too busy on the lookout for attention. excellent publish, very informative. I ponder why the opposite experts of this sector don’t realize this. You must continue your writing. I’m sure, you’ve a great readers’ base already! This site is my intake, rattling excellent style and design and perfect content. I was recommended this website through my cousin. I’m no longer certain whether or not this submit is written by him as no one else know such certain approximately my difficulty. You’re wonderful! Thank you! F*ckin’ remarkable things here. I am very glad to see your article. Thank you so much and i am taking a look forward to contact you. Will you kindly drop me a mail? I will immediately clutch your rss feed as I can not to find your e-mail subscription hyperlink or e-newsletter service. Do you’ve any? Please let me realize in order that I may just subscribe. Thanks. Just wish to say your article is as surprising. The clarity in your post is just excellent and i can assume you’re an expert on this subject. Well with your permission let me to grab your RSS feed to keep updated with forthcoming post. Thanks a million and please continue the gratifying work. Do you mind if I quote a few of your articles as long as I provide credit and sources back to your weblog? My website is in the exact same niche as yours and my visitors would truly benefit from some of the information you provide here. Please let me know if this ok with you. Thanks! I’ve been exploring for a little bit for any high quality articles or blog posts on this sort of area . Exploring in Yahoo I at last stumbled upon this site. Reading this info So i’m happy to convey that I have a very good uncanny feeling I discovered just what I needed. I most certainly will make certain to do not forget this site and give it a look on a constant basis. The following time I learn a blog, I hope that it doesnt disappoint me as much as this one. I imply, I do know it was my choice to learn, however I actually thought youd have something attention-grabbing to say. All I hear is a bunch of whining about something that you possibly can fix if you werent too busy on the lookout for attention. Thank you a lot for sharing this with all people you really understand what you’re speaking about! Bookmarked. Kindly additionally visit my site =). We may have a hyperlink exchange agreement between us! Thank you for another informative web site. The place else could I am getting that kind of info written in such an ideal method? I’ve a project that I’m just now working on, and I have been at the look out for such info. Hey very nice blog!! Man .. Excellent .. Amazing .. I’ll bookmark your site and take the feeds also…I am happy to find so many useful information here in the post, we need develop more strategies in this regard, thanks for sharing. . . . . . Some truly select blog posts on this web site, saved to fav. I have been browsing online greater than 3 hours these days, but I never found any fascinating article like yours. It is pretty price sufficient for me. In my view, if all webmasters and bloggers made just right content as you did, the web will be much more helpful than ever before. My partner and I absolutely love your blog and find nearly all of your post’s to be just what I’m looking for. Do you offer guest writers to write content for you personally? I wouldn’t mind composing a post or elaborating on a few of the subjects you write about here. Again, awesome site! Hi there, I discovered your site by way of Google at the same time as looking for a similar subject, your website got here up, it looks good. I have bookmarked it in my google bookmarks. Some really marvellous work on behalf of the owner of this site, utterly great content. I conceive this site has some rattling fantastic information for everyone : D.
I’m really loving the theme/design of your weblog. Do you ever run into any internet browser compatibility problems? A number of my blog readers have complained about my blog not working correctly in Explorer but looks great in Safari. Do you have any ideas to help fix this issue? Have you ever thought about including a little bit more than just your articles? I mean, what you say is important and everything. However just imagine if you added some great images or videos to give your posts more, “pop”! Your content is excellent but with pics and videos, this blog could definitely be one of the greatest in its field. Amazing blog! I’ve been exploring for a little for any high-quality articles or blog posts in this sort of area . Exploring in Yahoo I eventually stumbled upon this web site. Reading this information So i’m glad to show that I have a very excellent uncanny feeling I found out exactly what I needed. I such a lot no doubt will make sure to do not put out of your mind this site and give it a look regularly. You actually make it appear so easy along with your presentation however I in finding this topic to be really one thing that I think I would never understand. It seems too complex and very broad for me. I am having a look ahead on your subsequent submit, I will attempt to get the hang of it! obviously like your website however you need to test the spelling on quite a few of your posts. Several of them are rife with spelling issues and I find it very troublesome to tell the reality on the other hand I’ll surely come again again. Hey There. I found your weblog the use of msn. This is a very smartly written article. I will be sure to bookmark it and come back to read extra of your useful information. Thanks for the post. I will definitely comeback. With almost everything that appears to be building throughout this area, your perspectives tend to be rather stimulating. Nevertheless, I beg your pardon, but I do not give credence to your whole suggestion, all be it exciting none the less. It appears to us that your opinions are not entirely justified and in simple fact you are generally yourself not entirely convinced of the argument. In any case I did take pleasure in looking at it. What i don’t realize is in reality how you’re now not really much more neatly-liked than you might be now. You are so intelligent. You understand thus significantly in the case of this matter, produced me individually consider it from a lot of various angles. Its like women and men are not involved until it?¦s one thing to accomplish with Woman gaga! Your individual stuffs nice. Always handle it up! Hi! Quick question that’s totally off topic. Do you know how to make your site mobile friendly? My website looks weird when browsing from my apple iphone. I’m trying to find a theme or plugin that might be able to correct this problem. If you have any recommendations, please share. Appreciate it! In this great scheme of things you’ll receive a B- for effort. Exactly where you actually confused me personally was in the details. As it is said, the devil is in the details… And it couldn’t be much more accurate right here. Having said that, let me inform you just what exactly did deliver the results. The writing is certainly highly engaging and that is possibly the reason why I am making the effort to comment. I do not really make it a regular habit of doing that. Second, whilst I can see the leaps in logic you make, I am definitely not sure of how you appear to connect the points which help to make the final result. For right now I will subscribe to your issue however hope in the future you actually connect the dots better.